After the French Revolution and the Napoleonic Wars, the leaders of Europe aimed to establish a new balance of power. The 1815 Congress of Vienna ushered in the emergence of a genuinely European security culture. 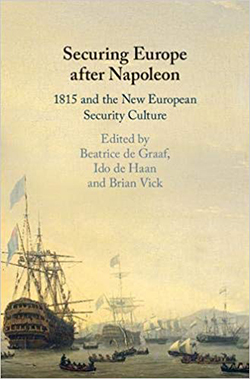 Securing Europe after Napoleon offers new insights into the military cooperation, ambassadorial conferences, transnational police networks, and international commissions that helped produce stability. Ido de Haan, a co-editor of the book, is Professor of Political History at Utrecht University and Queen Wilhelmina Visiting Professor at Columbia University. Beatrice de Graaf is Professor of History of International Relations & Global Governance at Utrecht University. Brian Vick is Associate Professor of History, Emory University. Adam Tooze, Kathryn and Shelby Cullom Davis Professor of History & Director of the European Institute.